Yes, "I want to be beautiful in that way..." I am agreeing with you in that! It can be so hard in this world and culture to avoid the beauty trap. However, makeup does cover up the dark circles that we get because we've been up all night or are just not getting enough rest. Then, we appear to be more refreshed. That may be what folks are commenting on. But I do agree. I want to be beautiful because of who I am and how God made me. Sometimes we tend to fret about what others think of us. More important to be concerned about what God thinks of us. I once heard this: We are not what we think we are, nor what others think we are, but often fall into this trap : we are what WE THINK others think we are! And that may not be true at all. It's hard to draw the line between people-pleasing and caring for oneself. YAY for not shaving!!! Such a fan and so freeing! As for the make-up; I find myself doing the same thing since I hardly wear it and I get compliments when I do. Part of me feels good when I get compliments and part of me wants to roll my eyes. It's the "what are you so dressed up for?" comment that embarrasses me... like I look so crappy every other day. So, I guess I probably do. Oh well. I liked this post a lot! 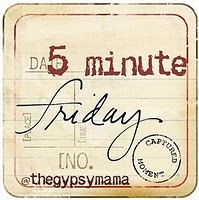 One of your best five minute fridays for sure! I took time and thought my own reasoning through and the truth is that my armpit hair grosses ME out. I get negligant on shaving my legs because I am a mom. I wear makecup on ocasion because I like to feel special, and pretty. So I suppose I do things like that because I like to. I shave every day. Well, not my legs. I am blond so my legs can go once a week for sure. You are quite beautiful (makeup or no).